If there’s one reason to watch The Daily Show, it’s to see correspondent Roy Wood Jr. in action. And on Thursday, Wood once again ethered Donald Trump. Wood and Daily Show host Trevor Noah spoke about how some of the things Trump has said sound like they come straight out of a rap video. “Trump doesn’t belong in the White House. Donald Trump belongs in a rap video,” Wood told Noah. 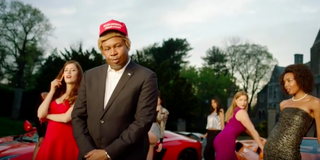 “Everything Trump says is straight out of a rapper’s playbook. He brags about his money, he’s disrespectful to women, and there’s always fights at his concerts. And so it was done. Every line is an exact quote from Trump.